Here at B. Young Salon we want to give you the best hair styling and cutting experience in the surrounding Allentown, Bethlehem and Lehigh Valley area. Read our customers frequently asked questions to help you when visiting to our hair salon. If you have any question, need hair styling tips or want to schedule a hair styling appointment contact us today! Why do conditioners make my hair too soft? You may be “over moisturizing” your hair – too much of a good thing. There are lighter conditioners, ask your stylist which is best for you. Do I have to wait until my entire old perm has grown out before I have another one? No, perms today compensate for different porosity in the hair so the perm will “take” evenly all over. Why does my perm “fall out”? Perms “calm down” within several weeks. They should last until they are cut away. 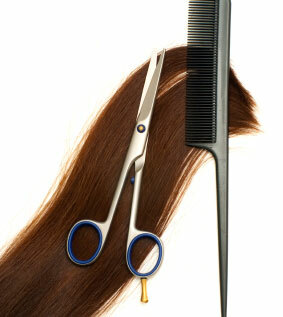 Your new hair growth will not be permed, so your style may seem to flatten, especially at the top. Perhaps a partial perm in the top area will help your style until the next perm. The average life of a perm is three months, depending on how often you trim. What is the difference between a body, a regular, and a spiral perm? A body wave is a regular perm, but larger rods are used for less curl, more body. Spiral wraps are a “special technique” where the hair is wrapped spirally like a corkscrew for that effect. At least six inches of hair are needed for this type of perm. My hair looks great when I leave the salon, why can’t I get it to look like that at home?